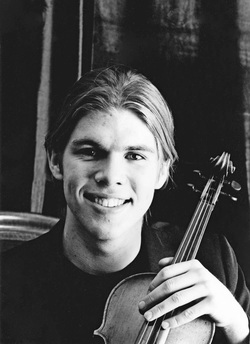 American violinist James Garlick was born in Port Angeles, Washington and began studying violin at age five. As winner of the 2006 Ladies Musical Club of Seattle Solo Competition, he toured the state of Washington, presenting solo recitals, master classes and public school outreach programs. James has appeared as a soloist with the Port Angeles Symphony, the Turtle Bluff Orchestra, the Port Angeles Chamber Orchestra, and the Port Townsend Orchestra. A 2006 graduate of the Oberlin Conservatory, he was frequently concertmaster of the Oberlin Orchestras and Oberlin Contemporary Music Ensemble, and worked closely with conductors such as Robert Spano at Carnegie Hall and Sir Simon Rattle. At Oberlin, James studied with Gregory Fulkerson. James was a full scholarship student of Paul Kantor at the Aspen Music Festival, where he was a member of the Aspen Festival Orchestra and Chamber Symphony, and worked with conductors such as David Robertson, Leonard Slatkin, James Conlon and David Zinman. As a chamber musician, James has performed in China, Spain, Italy, and the United States, and has performed live on Seattle’s classical radio station, KING FM. He is the newly appointed concertmaster of the Cascade Symphony Orchestra after performing in the orchestra’s 45th anniversary concert in Seattle’s Benaroya Hall and was invited by music director Ingrid Matthews to join the Seattle Baroque Orchestra next season. As a strong advocate of contemporary music, James has participated in world premieres and performed new works in critically acclaimed concerts in New York’s Carnegie Hall, Merkin Hall and Columbia University’s Miller Theatre. He has collaborated with composers Sir Harrison Birtwistle, Jennifer Higdon, Olga Neuwirth and many others. Most recently, James was concertmaster of the widely acclaimed American premiere of Ms. Neuwirth’s opera, Lost Highway. He will give the world premiere of a composition for solo violin by Oberlin Conservatory professor Lewis Nielson in the 2007-2008 season. James performs on a late 19th century French violin by Justin Derazy. James has also earned a bachelor’s degree in neuroscience from Oberlin College, and maintains an interest in neurobiology and music, especially the neural basis of musical emotion. Currently, James is an auditory neurobiology scientist at the University of Washington School of Medicine in Seattle, studying the neurobiology of hearing loss and cochlear hair cell regeneration. In his free time, he enjoys competitive long distance running, hiking, and sailing.